KCR Software Package Thermal. We have updated THERMAL to handle larger models, added multi-threading and increased solution speed. We have tried to maintain the same user interface. THERMAL is a technical routine for temperature analysis of a structure, large or small, that houses a mechanism for absorbing or giving off heat in some form. Some common structures that would require such analysis would be PC Boards, electrical equipment, solar systems, plastic molds, residential and commercial heating / air conditioning systems and the like. This routine performs analysis through the use of finite difference modeling. Editing features have been included that speed model generation and facilitate error discovery. This program has been designed to be particularly useful to technical personnel and care has been taken to simplify use whenever possible. The help file is included with the routine and is actuated with the F1 Key. THERMAL uses finite element modeling to determine component temperatures while handling conduction, radiation and convection heat transfer for both steady-state and transient conditions. Unique model editing features of this routine include the substitution feature, insertion / deletion feature and a repeat feature. The substitution feature provides a method of changing whole blocks of data with a single input. Sequential nodes numbering is not required and insertion and deletion of a node can be easily accomplished. The repeat feature reproduces previous data by simply pressing a key. This routine is obviously designed with the user in mind. It has many features to make it simple to use while the program is capable of calculating very complex, technical problems. The results are printed in a from that is readily understandable and efficient. THERMAL is very simple to use, F1 will access the Help Menu. THERMAL offers many editing features to facilitate model generation and error discovery. THERMAL does not require sequential node numbering. THERMAL allows an unlimited number of boundary nodes. THERMAL is capable of handling an unlimited number of heat sources. THERMAL performs analysis for steady state and transient conditions. THERMAL utilizes a node generation routine for ease of data input. THERMAL allows data to be entered as conductance (BTU/HR Deg. F) or as resistance (Deg. C/Watt). THERMAL is fast, solution for a 1000 node model is reached in seconds. THERMAL supports multi-threading for faster solutions of larger models. 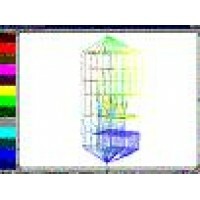 THERMAL arrives at the solution through the use of matrix manipulation. This manipulation solves the interacting heat conductance's and temperatures as a single set of simultaneous equations. This procedure provides an exact solution rather than the more common approximation techniques used in many other finite difference routines. Once the material has been divided into nodes, the user must determine the coupling values before data input may begin. An example is provided in the user's manual to assist in determining the coupling values. THERMAL is presently capable of handling up to 1,000,000 nodes; but since solution size and time are based on the model size squared, it takes 400 Gbytes of disk memory for a 1 million node model. We are working on that problem. Thermal may be downloaded from this web site and will run for about 2 months for testing and evaluation. The routine contains a copy protection subroutine that is unique to your computer's serial number and will require an authorization code to continue running.